Most folks know the story of Fred Harvy and the Santa Fe, how he brought high standards, good food and service to the railroad. What we may not remember is how magnificant the Harvey Houses were themselves. Built in the first quarter of the twentieth century, they featured the latest in design and furnishings and served not only as restaurants, but hotels, shops and tourism centers. 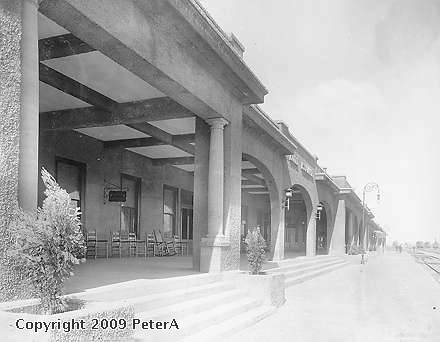 The small Santa Fe town of Ash Fork, Arizona received its new Harvey House in 1907 to replace the original ATSF station, and it was a magnificant structure beyond belief. Why Ash Fork? 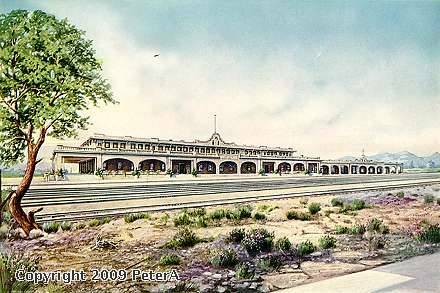 At that time Ash Fork was the junction of the Santa Fe main line and the line to Phoenix, so many passenger trains started from here. Of more importance to the railroad was the fact that Ash Fork lay at the bottom of a 2000 foot grade up to the Arizona high country at Williams and Flagstaff and thus was the location for the addition of helpers to every train. 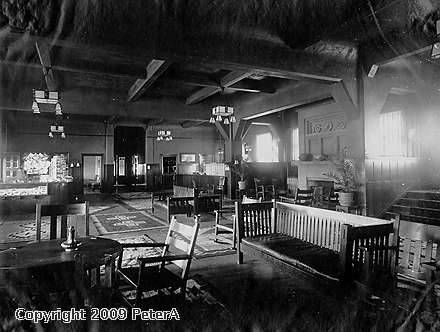 The Ash Fork Harvey House, the Escalante, was the center of the town's social life, served as the center of a small tourism industry and housed many railroad men during layovers. However, in the early 1950's, as a result of travelers migrating to businesses along Route 66, the hotel and restaurant closed. Then, in 1960 a major relocation took the main line ten miles north of town to reduce the ruling grade from over 3% to just over 1%. The Santa Fe abandoned one of the two original main line tracks down the hill from Williams to connect with the line to Phoenix. The railroad presence in Ash Fork almost disappeared as it was left as simply a crew change point. 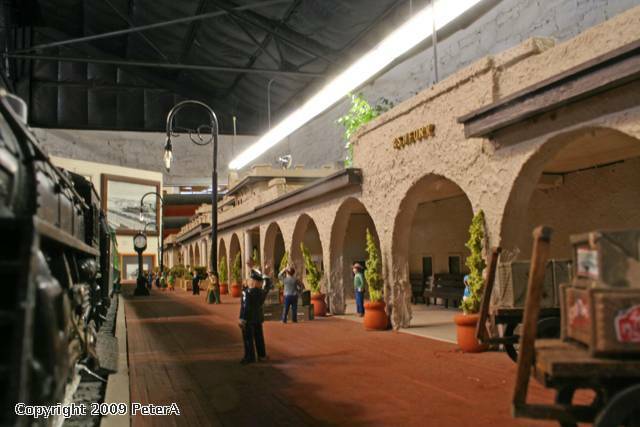 At that time passenger service to Phoenix was being phased out. Thus in the late 1960's the Escalante was demolished. 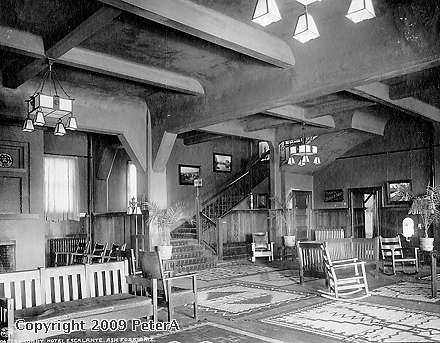 Today, only La Posada in Winslow, AZ, remains as a functioning, restored Harvey House, to remind us of the glorious structures that greeted travelers in the first half of the 20th Century. Fortunately, in Ash Fork, there is a delightful local history museum devoted to the railroad and to the highway's influence. 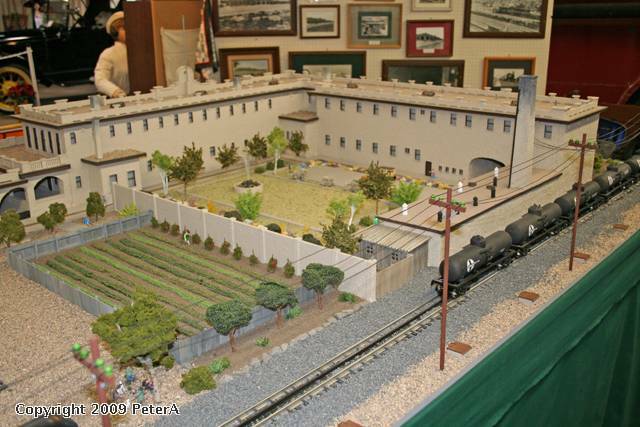 The centerpiece of the museum is a magnificant quarter inch scale model of the Escalante built by a local couple, Wayne and Nancy Ulrich. 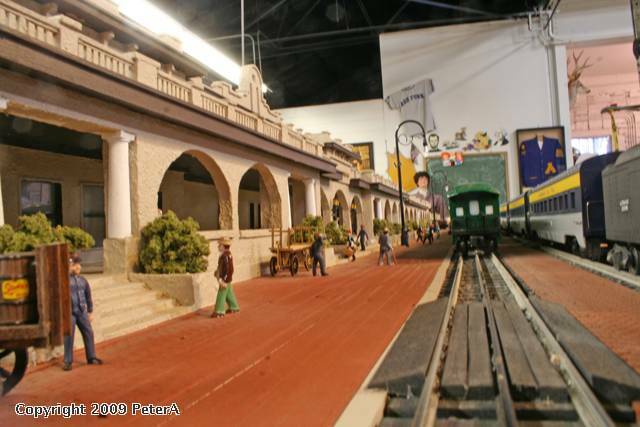 To get a feel of the size of the original, the model itself occupies an eight foot long table. If you are ever travelling on I-40 in Northern Arizona during a weekday, do take a short detour into town and follow the signs to the museum (it is open during weekdays only). 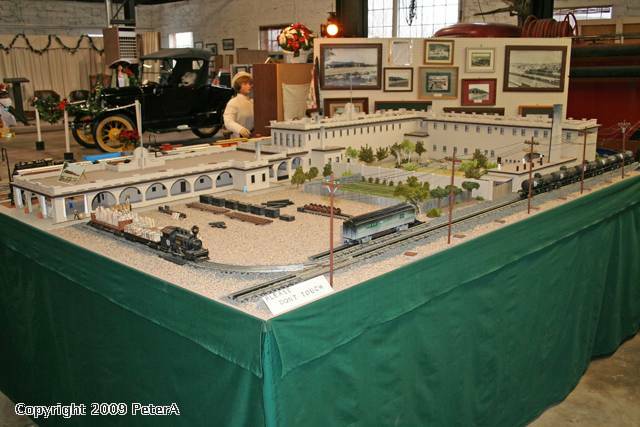 I think you will enjoy the model as well as some of the other artifacts from the hotel, railroad and the old Route 66 town. PeterA - thanks so much for the fascinating and well-written history, and the terrific photos of this stunning work. That is a huge station! I really like the attention to detail Wayne and Nancy put into it - including potted trees, stucco arches, benches, lamp posts and clocks. 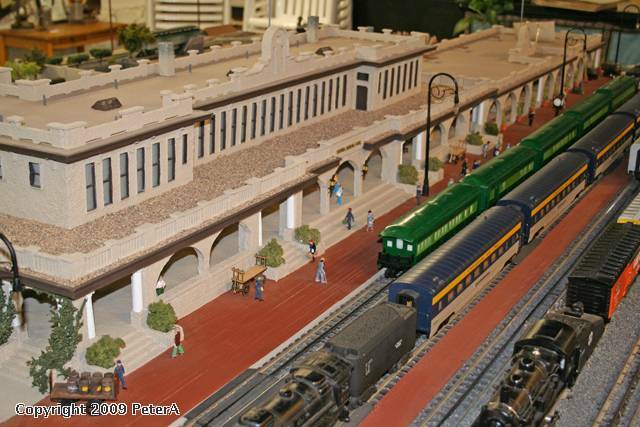 Nice post, history and modeling - the architecture along the route of the Chiefs is and was impressive, including the new Albuquerque intermodal station. Always fun to take the Southwest Chief from Kansas to Fullerton, CA.